Such nice plants and they came so quickly. I am so pleased. I was totally shocked by the fast shipping! LOVE IT! Put it in my fairy garden and it looks great! Hedwigia Moss is also scientifically known as Hedwidia Ciliata. This plant will make a fantastic groundcover for natural areas and also large places on a lawn or landscape. It will grow best when planted in areas where soils are and will remain moist. They will also do well in full shade and partially shaded areas. These moss plants will not provide any flowers and will supply a brilliant shade of green when grown. It is great for planting in the northern parts of the United States and is particularly hardy. This plant has an unusual and different appearance that makes it stand out among others in its group. The tendrils on this moss are long, and arm like and also have edges that give it a great look. Hedwigia Moss will be similar in appearance to that of a coral reef and will look very natural no matter where it may be planted in the landscape or garden area. It can grow in a wide variety of areas from rocky soils to those more delicate in content. This is a great one for planting in mass and will bring a lot of texture and color to the area. Give this moss a try for something that is both unique and extremely beautiful in appearance and color. It will not disappoint in any department. Hedwigia Moss makes an amazing groundcover for natural areas and even large parts of lawns or landscapes. 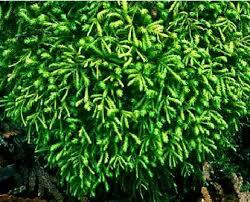 This moss will also grow well over rocky soils, as well as rich soils. It will do the best job in areas where soil will remain moist but also do well in full shade or partial shade. Though it has no flowers that bloom, its beautiful shade of green and leaves that resemble a coral reef which gives it a very distinctive look that accents any landscape or garden. Hedwigia Moss grows well in a wide variety of areas and is lovely at creating texture and color.